On our first day, we went to see the downtown and do a little light shopping at C&A, a department store. Everything is expensive in Sweden, and it makes sense to shop elsewhere if one gets the opportunity. I was in search of a nice-looking long-sleeved t-shirt, and found a rack of them; some were hanging in pairs, some hanging in singles. I only wanted one, so I picked one out and headed up to the counter with it and some other items. The cashier frowned. "No, you cannot have this one," she said, "it is only available if you buy two of them." "But I only want one," I said, "and I will pay the same price." "No, you cannot have it, you must have two or none," she said, and took the shirt and hanger away from me, and handed it over to a (presumably more junior) clerk and barked an order. Astonished and now a little miffed, I scooted back to the rack of shirts as fast as I could, to find the same junior clerk busily going through the rack and removing all the wayward single shirts (all the color and size I wanted, mind you). I managed to grab a hanger with one shirt that I wanted and one shirt that I did not, and went back to the cashier, where my purchase was approved with perfect courtesy and even a smile. Oh those Germans! (Note: Most of the following links go to my gallery pictures, so follow them for a small guided tour.) We then wandered through a bit of the surviving old town, including a large church featuring punks sitting on the steps, scary skeletons, scowly statues of Martin Luther, and a both a pentagram and six-pointed star at the top. Since it was the Fourth of July, I had American-style chili for lunch. We did a large circuit of the town in the afternoon, admiring the town and the river and the city hall building and the riverside sculptures of Niki de Saint Phalle. 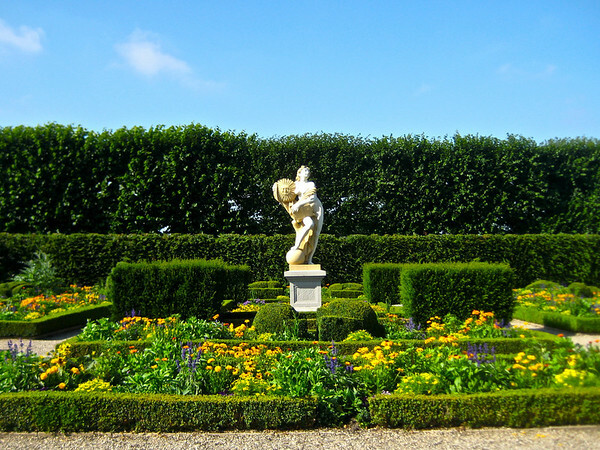 One of Hannover's best known attractions is Herrenhausen Gardens, ordered by Sophia, Princess Palatine of the Rhine and Electress of Hannover from 1692 to 1714. It's a true Baroque masterpiece, and as befits a German royal garden, there is not a stray leaf or twig out of place (I found one flaw in the whole place). 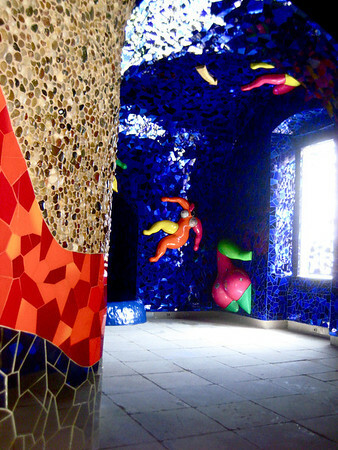 And one of the gems in the garden is The Grotto, an installation by the aforementioned Niki de Saint Phalle. It's an absolutely charming interior, full of color and light, and it just makes you smile to be in it. The feeling of such an exhibit is impossible to capture with a camera, of course, but you get the general idea in the picture to the left, and there are more pictures in the gallery. Should I use this self-portrait for a profile? After we had lunch and they let me out of the cafe, S. and I wandered off into the rest of the garden, stopping at the large pools to look back at the buildings we had passed and been through as we came in. Right between The Grotto and its mirror building, The Cascade (water not turned on yet), were a couple of cranes, whose presence we had already wondered about. But looking back on it from this angle it became obvious. "Jaaaa, of course!" said S. "It's a Baroque garden. What's missing? A Baroque palace!" And she is right. The Palace was bombed in the 40s, but now the city is taking up reconstruction. Please watch this video for a 'how the reconstructed palace might look', highly recommended also it for the bombastic music that accompanies it once you get past the bird sounds and Baroque tinkles. Herrenhausen has everything a fussy royal garden should have: statues, fountains (they did turn on the water for the park between 2 and 5pm; there is so much water that I can understand that a little bit of conservation is in order), smaller gardens, wild tracts, a really big fountain, an outdoor theater (which we couldn't see the front of, because they were rehearsing a production of "The Tempest" done as a sci-fi musical), an Orangery, places to grab a coffee or a beer, sunken gardens with cacti... Yes, cacti. Although we spent most of our time in the formal garden, Herrenhausen also includes a wonderful Botanical garden across the street, with many greenhouses, one of which contained birds and intriguing orchids. After this good solid day's touristing, we caught a train back into downtown in time to find a brauhaus that was showing the evening's marquee soccer event, hosts Germany against France, and also willing to feed us some good local beer and greasy game food. The pub was full if not crowded, with about 50 interested game viewers, maybe four of whom were women (including S. and myself). It was a good game to watch with a pub crowd: plenty of goals, plenty of good play that was cheered, some bad referee calls that were hooted, and of course it was against France, so perhaps there was a little extra interest.